PNR stands for Passenger Name Record. While the word PNR is widely used in railway reservations lingo, certain airlines prefer to call PNR as Booking Reference Number. A passenger gets a PNR number when you book a reservation with Indian Railway or one of the Indian airlines. 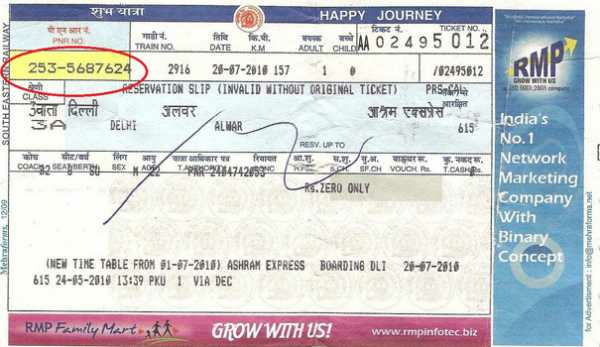 A PNR number is a 10-digit number printed on a railway ticket. It can be found at the top left corner of a ticket. A passenger can also check the status of reservation through Internet. A passenger can also check the status of IRCTC reservations through mobile phone and landline phone. Checking PNR status via SMS is undoubtedly a handy and quick way. Indian Railway introduced the SMS service to provide a simple way to check PNR status using mobile phones. All a passenger needs to do is send an SMS on 57886 through his/her mobile phone to get any kind of information on railways. The SMS facility provides various ways to perform enquiries like train alert, PNR status, train status, seat availability, train schedule, train information, train time table, train fare etc offered on the Indian Railways website. Now one can view such information on a mobile phone through SMS facility. To receive a list of available SMS commands, simply send TRAIN to 5676747. You will get a reply similar to, "Welcome to railzone. Reply with PNR - PNR Status, TL - Train List, TA - Ticket Availability, e.g sms PNR to get PNR status." Now to check your IRCTC reservation status, send a SMS "PNR <your PNR number>" without the double quotes to 5676747. For example, PNR 1234567891. You will get a reply similar to, "PNR No. 1234567891 , 1. RAC 33, 2. Confirmed AS2 34, 2952 Mumbai Rajdhani, New Delhi - Kota, 17 Aug". Alternatively you can call 139 from your BSNL, MTNL, Airtel, Vodafone etc landlines. Most telecom service providers support 139. If you have internet connection at home, you will probably prefer to go online to check pnr status of your railway reservation. The advantage is that you do not need to pay any SMS or call charges. Another advantage is that you can quickly print / email the reservation status.